Cyclonus uses mind control to combine with any bot, siphoning the powers of whichever Autobots or Decepticons will serve his purpose of unleashing chaos across the universe. Robot Mode: Cyclonus is an extensive retool of Combiner Wars Silverbolt, but since I don't have that figure, this is my first go at the mold. First thing first, resemblance to the character Cyclonus: nicely done. Given that this mold was not originally intended for Cyclonus, the new wings, the familiar horned head, and the new colors do a superb job of transforming it into a good likeness of the character. He’s a bit beefier than previous Cyclonus figures, but overall no complaint in terms of likeness. Articulation is as good as you expect from a current Transformers figure of this size, so no complaints here, either. Cyclonus has neither twisting wrists nor can he twist at the hip, but otherwise he can bend just fine. In terms of weapons, though, Cyclonus really should have gotten a different gun than just a grey recolor of Silverbolt / Superion’s gun. The weapon is really oversized, even if you remove the rear part and have him carry it as a shield that in no way looks like a shield. A normal-sized gun or a Targetmaster would have worked better here, I think. Additionally, though, Cyclonus can remove the two small steering fins from his arms and use them as knives. So overall: not bad. Certainly not the best Cyclonus robot mode ever, but good enough considering that the figure also doubles as a combiner torso. Alternate Mode: Cyclonus, true to form, transforms into a long-nosed futuristic space jet. It’s not quite as sleek a jet as other Cyclonus figures have managed, but it’s still easily apparent to be a space craft and looks quite good. It does have quite the underbelly, sadly, and the arms of the robot mode are rather visible underneath the wings, but still, overall la good looking jet. It has a working landing gear and you can mount Cyclonus’ big gun underneath the nose (though you can’t extend the landing gear now), but it looks somewhat oversized in my opinion. Bottom line: a decent jet mode. Not the best, but sufficient. Combiner Mode: As a Voyager-class Combiner Wars figure, Cyclonus is also the torso of a five-figure combiner. Unlike most other Combiner Wars figures, he does not come with an established group of Deluxe class figures as limbs, but is instead described as using mind control to acquire whatever limb-bots he needs. So Galvatronus, as he is called when combined, has no ‘correct’ configuration, he’s a mix-and-match guy. Galvatronus is basically Cyclonus upside down, with the robot mode arms becoming the thighs and the Galvatronus head flipping out from what used to be Cyclonus’ crotch. The robot legs forming the chest do a pretty good job of replicating the classic G1 Galvatron look and the head is a very close match as well. Once combined with whichever limb robots you want, Galvatronus is a very nicely articulated combiner and looks pretty good. The resemblance to Galvatron somewhat depends on your choice of limbs, of course, and sadly I had no giant orange/yellow gun available for him, but overall: no complaints. A nice combiner mode with no flaws. Remarks: For the longest time Cyclonus was the loyal second-in-command to Decepticon leader Galvatron, even when Galvatron was at his craziest. In the IDW comics, though, Cyclonus finally broke away from Galvatron when his actions threatened the survival of Cybertron and since then Cyclonus is a self-described neutral and hangs around on the Lost Light with the Autobots. As for his role in the Combiner Wars story... well, he wasn't involved. At all. He didn't fight any combiners and he certainly didn't become part of one. So while the idea of Cyclonus being part of a Galvatron(us) combiner is fun, it has absolutely no in-fiction background, especially as IDW’s version of Galvatron is being portrayed as being totally opposed to that whole combiner thing. 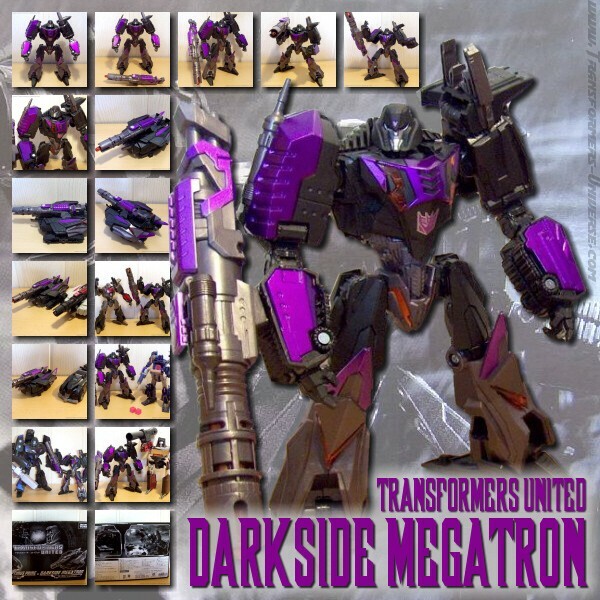 And while there is a Megatronus, there is no such character as Galvatronus. As for the toy, it's a bit of a complicated matter. If you're simply looking for a good stand-alone Cyclonus figure, I advise you to get yourself one of the various variations of Deluxe Cyclonus (Universe, Henkei, Reveal the Shield, etc.) if you haven't got one already. If you're looking for more combiner fun, though, Cyclonus is far from a bad choice. Sadly there are no Sweep drones in the Combiner Wars line-up for him to link up with as limbs, but Galvatronus looks good in all sorts of combinations. So bottom line: not the best Cyclonus figure, but a pretty good Combiner Wars figure.